A non-surgical nose job is a great alternative available for people interested in improving the shape of their nose without undergoing invasive surgery. The benefits of a non-surgical nose job are that the procedure is quick (approx. 30 minutes), downtime is around 1-2 days and the results are natural and balanced with your features. By using a dermal filler we can reshape and contour the nose to achieve results that were previously only ever possible with plastic surgery. Injections are usually shallow, and topical numbing cream helps to ensure a comfortable experience. Minimal downtime. You may resume your regular activities right after the treatment. There is often mild redness or bruising at or near the treatment area, but it resolves quickly and can be camouflaged with makeup. Results last up to a year. More economical than a surgical nose job. It can be performed alone, or as part of a comprehensive non-surgical facial enhancement programme. Am I A Good Candidate for Non-Surgical Nose Job? Non-surgical nose reshaping can be performed on any patient who wishes to improve the appearance of the nose but doesn’t want a surgical rhinoplasty. However, a large nose cannot be made smaller, although a bump or hump on the bridge can be smoothed out using this method. A non-surgical nose job is ideally suited for refining the nose or correcting small areas to enhance the general look of the nose. Patients who desire a significant change of the nose shape and size, or who desire alteration of bone and cartilage structure, are not a good candidate for non-surgical rhinoplasty. It is performed under local anaesthetic in an outpatient setting without the need of any hospital stay. The procedure normally takes less than 30 minutes to complete. Firstly your doctor will clean the nose area that is to be treated, then uses a thin needle to introduce a hyaluronic acid filler (we typical uses Juvéderm, Restylane or Perlane). 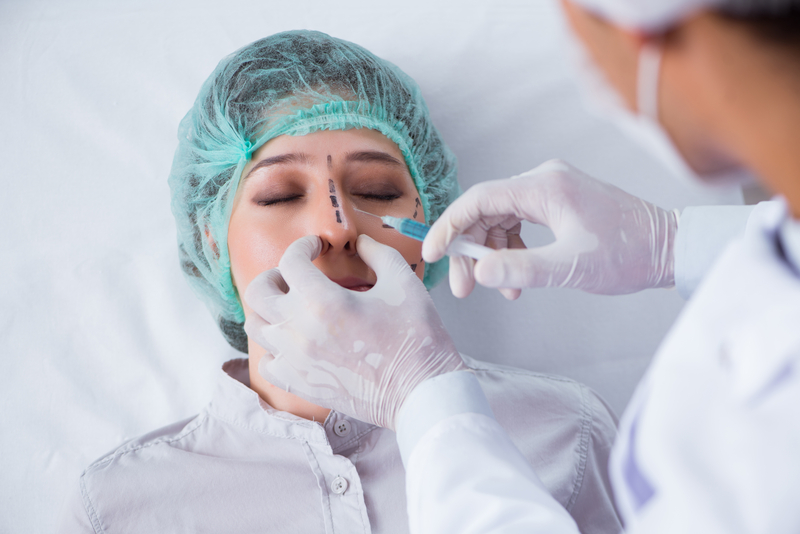 Through this tiny needle, the filler is injected under the skin to elevate or create volume, in areas such as minor humps, depressions, drooping and irregularities. Although fillers are generally safe in the right hands, with any medical treatment, there are potential side effects. You may experience temporary bruising, swelling, tenderness after the treatment. These can be discussed with the doctor before any treatment is undertaken. The rare risk/complications may include infection, skin discolouration, bumps or nodules. Non-surgical Rhinoplasty involves minimal pain and downtime. You can resume your normal activities after 2 days. You should avoid pressure on the nose for 5 days, so you should avoid sleeping on the front or side and ideally avoid wearing glasses for a week. Minimal bruising may occur which usually resolves in 5 – 7 days. The nose could also be tender for 3 to 5 days after treatment. The results are subtle and natural. Non-surgical nose shaping will enhance the appearance of the nose ensuring that it is more aesthetically balanced with your features.Typically, the results will last from 6 to 12 months, though if you are not happy with the results, the treatment can be reversed. Is a Non-Surgical Nose Enhancement a good alternative to a traditional Rhinoplasty? A non-surgical nose enhancement cannot, of course, replace a traditional Rhinoplasty especially where there is a desire to dramatically reduce the size and/or width of the nose. Small irregularities and deviations can easily be corrected in this safe and effective treatment under local anaesthetic. It can also be a great option to correct issues following a previous Rhinoplasty when you want to avoid further revision surgery. What is the cost of a non-surgical nose job? The price is usually £350, but may increase if more filler is required. Dr Goyal, the lead GP, runs the MK Aesthetics clinic in Milton Keynes. He is also a dermatology doctor/GP partner at a practice in Milton Keynes and part of the dermatologist team in Bedford Hospital. Dr Goyal is Harley Street trained and certified to carry out all the treatments offered at MK Aesthetics. A specialist in the field of Cosmetic Medicine, you can be sure you’ll be in safe hands. If you would like to know more about our Non Surgical treatments please do call us on 01908 766 276 or book your consultation or email us on info@mkaesthetics.co.uk. This was one of the best choices I’ve done in my life. The whole experience was amazing, the staff are so nice and friendly, they give a full through honest explanation of the procedure, they made the procedure as comfortable as possible and most importantly the results where amazing! I’m so excited with my new nose! I would definitely go there again next year.